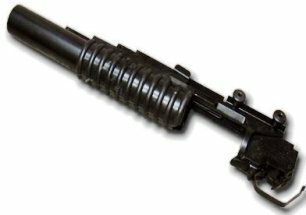 Airsoft Grenades | What are Airsoft Grenade Launchers? Smoke Grenades? What is an Airsoft Grenade? Airsoft guns have a great deal of potential when it comes to simulating combat games. The design of many of the military based weapons allows these guns to present a completely new dimension to simulating combat. For those that wish to engage in more complicated war games or even role playing scenarios, there are new products that can add a new level of sophistication to the games. One of these new products is the airsoft grenade. Yes, an airsoft grenade is exactly what the name would imply. 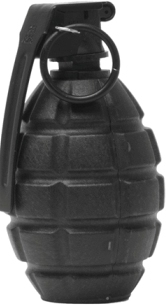 It is a replica grenade that delivers a huge blast of airsoft pellets. The way these grenades work is not much different than an actual grenade works. The grenade will contain a certain amount of gas that will act as the charge of the grenade. In the interior of the grenade you will add a large collection of plastic BB pellets. Then, you seal the grenade so that the BBs are held in place in the grenade's interior canister. The gas pressure will be released when you pull the pin from the grenade. So, when you wish to activate the grenade, you simply pull the pin from the grenade and throw it. Actually, it is advised to throw the grenade as far away as possible! After all, you do not want the pellets to blow back at you. Also, you will not want to get smoke in your eyes either as certain grenades will contain a smoke bomb effect that will add a unique dimension of realism to the proceedings. The smoke that emanates from the grenade will be a large cloud of smoke and while it will lack the sulfur smell of the real thing - that would be about the only difference. Well, actually, the fact that the airsoft grenade is not an incendiary device would be another obvious difference. In some cases, a particular replica grenade will send BB pellets in such a radius that it would be difficult for the person throwing the grenade to actually throw it far enough. Thankfully, there is an accessory that can aid the individual in sending the airsoft grenade as far as possible. 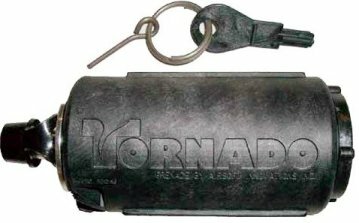 This accessory would be an airsoft grenade launcher and it can send the grenade several meters (or feet) away from where it has been fired. This can also add additional complexities to any combat scenarios since it turns the grenade into a long range weapon. Obviously, tactics would have to be modified in order for succeed when dealing with the offensive threat of a grenade launcher. Of course, it is also important to maintain a level of safety when using these grenades. One of the most important safety devices to wear would be safety goggles. Errant BB pellets run the risk of causing an eye injury in the absence of protective goggles. That is why they remain so highly recommended. Also, when possible, it is best to wear heavy clothing since this would reduce some of the impact of the pellets if they make contact with the skin. And, of course, one needs to employ an attitude of care towards others that might be in the vicinity of the grenade. Fooling around or taking risks would certainly not be advised when working with an airsoft grenade. They allow players to attack other players without having to aim or point a gun. They allow players to attack from longer distances, and to attack multiple players at once. Airsoft grenades can be heavy to carry. At best, most players are only able to easily carry a few. 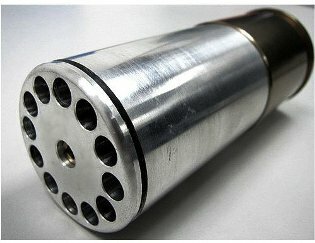 Airsoft grenades are gas powered, and they can use up a lot of gas. Airsoft grenades must be loaded with plastic BBs for every use. Players who want their grenades back have to go search for them in the field after use. Despite the few advantages, airsoft grenades can be great fun and add an element of realism and surprise to any game played with airsoft weapons. Those who want to bring something extra to their game should try portable airsoft grenades. We always suggest for those new to Airsoft to start out cheap! Just until you are used to the Airsoft guns and equipment, then it's best to move on to more quality Airsoft guns and rifles, once you have acquired some Airsoft basic skills!